Ground hamburger in pan as you normally would. In separate pan I put sesame oil, soy sauce, chopped up green onion and chopped up garlic together and stir fried it until tender. 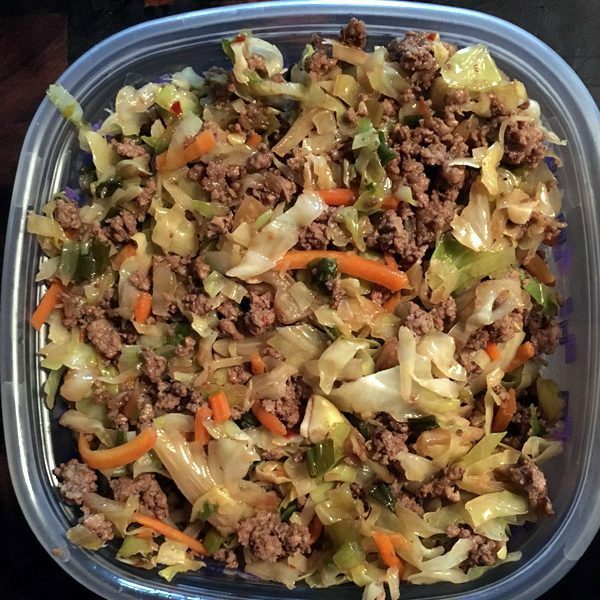 I then added the cabbage (cole slaw mix) , crushed red pepper and ground ginger and cooked until mostly tender, it still had a slight crunch to it which I prefer over super soft cabbage. Once that was done I drained the excess fat off of the hamburger and added it to the pan with the rest of the ingredients and stirred. I did add a touch more soy sauce for flavor but not much. Turned out awesome. The hubby and son loved it. Low carb, moderate fat and moderate protein, perfect! Servings: We split the batch up into 10 servings. Below is based on 10 servings of large batch above. I will be making this again soon and measuring the servings by the cup for more accurate nutrition info and will post an update when I do.